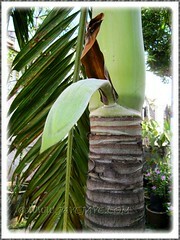 Somehow there are always some surprises in our tropical garden every month and November 2011 is no different! That’s the beauty of gardening and enjoying its rewards. It took about 4.5 months for this beautiful soft yellow Okra flower to emerge for the first time since seeds were sown in late June. Even though the flower smiled for only a day, it was sheer joy to be able to scrutinize its beauty and capture its loveliness on camera and to observe that it took just 3 days to produce the fruit that could have been harvested 3 days later. Since one little finger is definitely insufficient to tickle our palate, we allowed the fruit to mature further on the plant and use the seedpod to grow more plants. 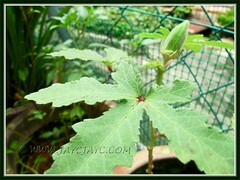 Hope to experiment further with the Lady’s Finger since our first crop of 4 plants, appeared not as healthy as desired. Rather disappointing as plants are skinny, stunted and leaves tainted with leaf spots… wonder why? 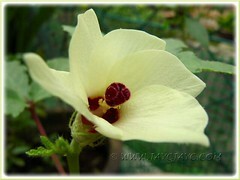 More information on Okra at Wikipedia. A long awaited event! Finally, our Manila Palm decided to reward us big time with two budding flowering stalks that emerged one week apart of each other. It took 6 long years, from the time it germinated as a seedling and was planted at the sidewalk outside our home, to see this happening. How exciting! Thanks to my beloved John that I got to capture many images of this beautiful visitor. Knowing how excited I could be whenever a butterfly visits our garden, he’ll call out to me to join him outside. Yours truly who is usually ‘glued’ to the iMac, will of course run out, equipped with the camera to do the expected. Even though we’ve captured images of the Chequered Swallowtail before, it’s never too many to include some more. To my surprise, this flying beauty was not intimidated at all when I brought the camera up close and happily snapped away almost 50 shots as it rested confidently on the red Dwarf Powder Puff shrub. More butterfly info here. We’ve been admiring this attractive ornamental foliage plant for a couple of months and succumbed to adopting it finally in November. Anthurium, Aglaonema cv. 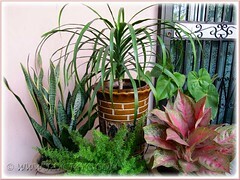 Legacy, Asparagus densiflorus ‘Myersii’, Sansevieria trifasciata and one of its cultivar ‘Laurentii’. A well-matured plant with clustered stems as seen on the right image above costs RM200 – fabulous looking but will dent our purse. Instead, we bought a very young plant as seen on the left image for RM26 and a ceramic pot to house it for RM30. However, we regretted allowing the garden center’s helper to influence us into pinching off its growing tip. It seems that will induce our plant to branch at the base and produce cluster of new stems, an appearance that captivates us so. Observing further, I think our plant is too young for that unwarranted shave at the top. Thus, we’ve decided not to further pinch the tip but allow it to grow naturally. We did some spring cleaning in the garden last month. A job that was long overdue. 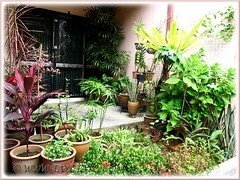 Large pots of aged and lifeless Duranta repens with purple and white flowers were finally discarded, together with Podocarpus and Umbrella Plant. Our potted Norfolk Pine, almost about 4 m tall has to go too but shelved for the time being as the task entails sawing the trunk into short lengths for easy disposal, etc. Next, our garden borders needed an overhaul. The inner plot was tackled first with the White Mussaenda tree that was heavily infested with mealy bugs downsized to half its height. With that cleared, the Blue Hydrangeas were exposed at the mercy of the sun’s harshness. Thus, we sat the Bird’s Nest Fern (Asplenium nidus) onto the sawed-off branches of the White Mussaenda to provide them with some shade. The extremely rusted aquarium stand that had acted as a base or shelf for some potted plants, as well as help shaded the ground covers below was finally removed too. AFTER: Hubby and I did some spring cleaning on this inner garden plot. Incomplete as yet… more need to be done. Cuphea hyssopifolia ‘Alba’ (Mexican Heather), the free flowering volunteer plant with the tiny white flowers in the left image, that had been missing-in-action for a couple of years decided to make a comeback at our inner garden border. Welcome home and thanks for brightening that garden spot! 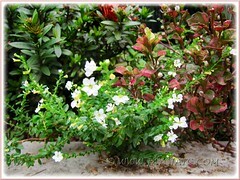 Hopefully your big brothers behind, the Ixora coccinea ‘Dwarf Red’ and Alternanthera ficoidea do not mind your intrusion. Gardening is invigorating and rewarding, provided you’re passionate about it and willing to get your hands dirtied. Maintaining a garden, even a small one can be somewhat taxing, especially when there are several heavy tasks awaiting our attention. Watering, feeding and weeding are no hassles but when large potted plants have to be replanted and probably discarded due to ‘old age’, unruly shrubs to be pruned and borders to be overhauled and tidied, these can be a strain on our aged backs. The spirit is willing but the flesh is sometimes weak where the frailties of our body sometimes make us incapable of carrying them out. Some mishaps that occurred while gardening have taught us not to throw caution to the wind, but to be always careful and follow the correct ways of carrying heavy loads and be sure to use a low stool when weeding instead of squatting. Not forgetting to use gloves when handling plants with poisonous sap that may cause skin irritations. All in all, gardening is fun, exciting and beneficial to body, mind and soul! Hello, thanks for the interesting post and website. Caring for the environment is caring for ourselves and the things we love. Gardening is great and arguably the only type of cordless lawn mower that’s better than an electric model, is a cordless lawn mower like the black and decker lawn mower. Why should you consider electric mowers in general? To begin with, they’re better for your ears and the environment than gas lawnmowers are, in other words, your eardrums and Mother Nature will thank you. However, cordless electric mowers are even better in many other areas as-well. There are many great features to look for when searching for the right Cordless Electric Lawn Mower. Thank-you from david. The wonderful thing about our DIY garden is that it is always changing. New plants are added while old ones go. You are so lucky to have a like minded hubby to share your hobby. The plant you are asking for ID looks like my Elephant Foot aka Pony Tail Palm (Beaucarnea recurvata), except that mine has a bulging base (caudex) but yours don’t. 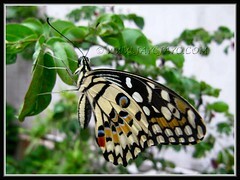 The butterfly you captured here looks like it is finding a suitable leaf to lay eggs. you have managed to spring clean your garden – that’s great! I had started but never seemed to be satisfied as there is always something to do and work on in the garden. Hope your garden brightens up your christmas with many beautiful blooms and sunshine. @ A.Belle: I’m blessed, indeed – it helps a lot with John being as passionate in gardening. 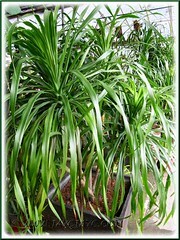 Our NOID plant is not Pony Tail Palm as the latter’s leaves have cutting edges. 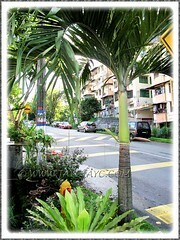 It has been identified as Madagascar Dragon Tree by a Flickr friend. Thanks all the same for helping. @ James : Aargh… we’ve wrongly timed our garden’s spring cleaning – didn’t realized that it’s too close to major festive seasons (i.e. 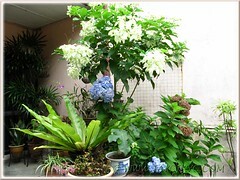 Christmas and Lunar New Year), hence replacement plants will be very costly. We were most fortunate to have chanced upon a pot of Costus woodsonii for only RM20, which costs RM55 for a similar pot-size at another garden center. Hmm… looks like a gloomy Christmas inside out this year for us – just not spirit-filled to put up our Christmas tree as John’s 87-year old mum has been hospitalized with heart failure and garden overhaul somewhat standstill with such pressing matters. Thank you for your wishes though.